This week, Denver Broncos quarterback Peyton Manning and his younger brother, Eli, are at Duke University getting in some reps with their respective wide receivers before organized offseason workouts begin next week. The two brothers weren't all business, though, taking some time to get in a few laughs. 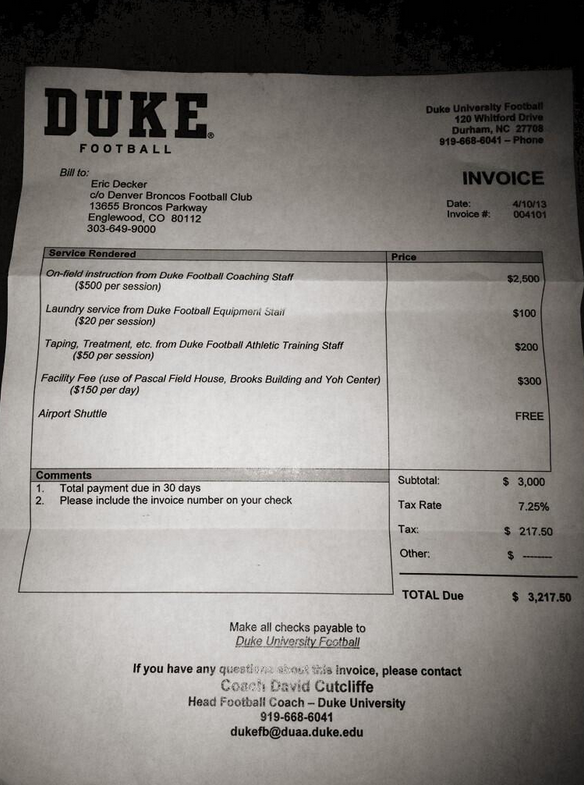 Manning pranked wide receiver Eric Decker by sending him a phony $3,217.50 bill from Duke for using their facilities and told Demaryius Thomas and Wes Welker to "play along". Decker says he has "a lot of options" when considering how to respond to Peyton's prank. It must run in the family — when ESPN.com's Chris Mortensen was trying to interview Peyton after the QB's workout on Wednesday, Eli was running his hand through Mortensen's hair, presumably to distract Peyton. It worked, as the elder Manning started laughing, with Eli grinning in the background. Peyton's prank on Decker and Eli's interview-bombing tactics were par the course for the two brothers—they've been doing this for years. In fact, Manning has also pranked Welker. Manning played in a pair of Pro Bowls with Welker when the two played in Indianapolis and New England, respectively. Two years ago in Hawaii, Manning got the best of Welker via a loosened Gatorade lid.